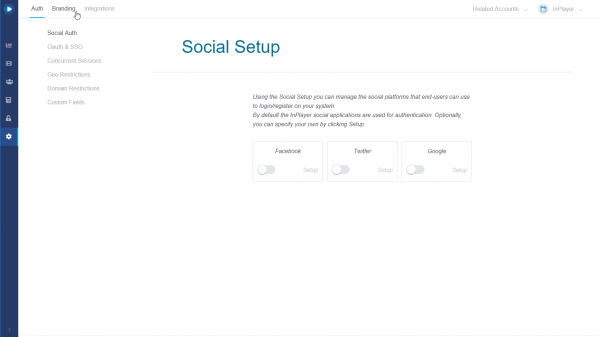 In the following guide, you will get more familiar with the Branding tab of the InPlayer Dashboard Settings. 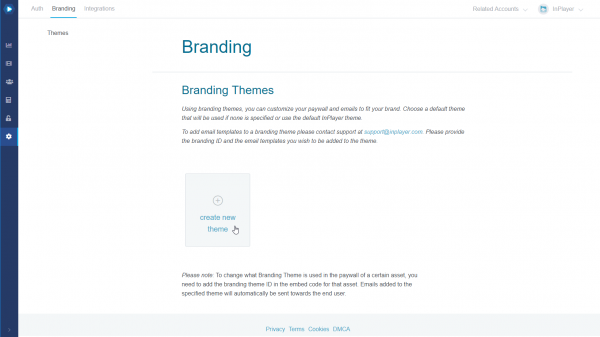 Branding themes are a white labelling feature that offers the option to customize the look of the paywall and automated customer emails to fit your brand. 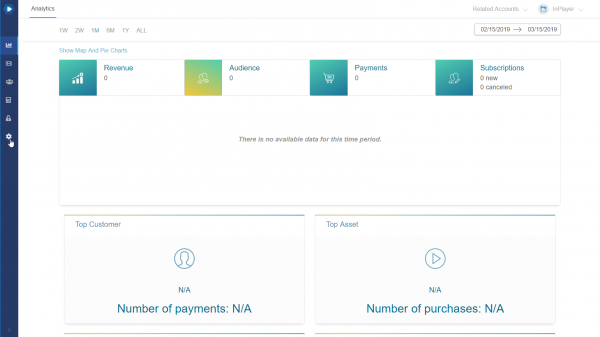 The look and feel of the paywall can be modified by using our merchant panel. The emails can be modified by contacting your dedicated account manager or our support team at support@inplayer.com. 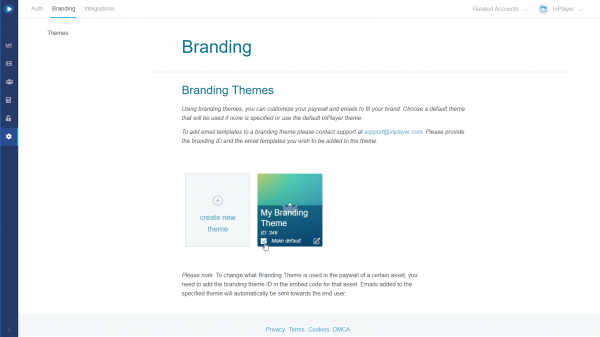 To create a new branding theme, login to your InPlayer Dashboard on the link below and go to Settings. Then, go to the Branding tab. Click on create new theme. 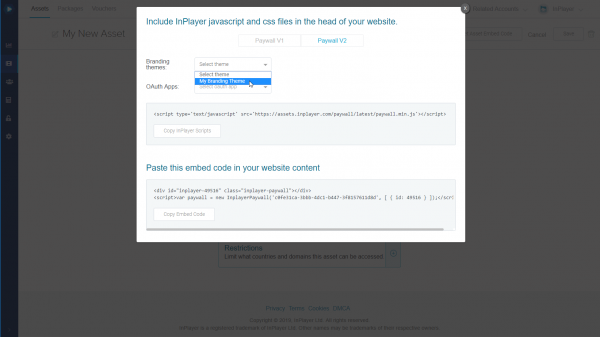 You can now start customizing your theme. First, write a Name at the top. A name would usually be your company’s brand name or your current project’s name. You can choose to upload a default Cover image. This is going to be the default cover image for your assets, however, you can still set a custom cover image for every individual asset. Here you can choose to either enable or disable the Top border and Protected label on the assets, as well as pick a background and text colour for the Buy button on the assets. Here you can upload the logo that will be shown on the paywall. You can also set the background of the logo banner, as well as choose whether to show or hide the logo on the paywall. Here you can set the paywall’s primary colour, as well as the colour for the buttons. When you’re done setting everything up, just click at the top right. To edit an already existing theme, just go to the Branding tab, and click the button on the theme you wish to edit. This will open the theme and you will be able to modify it to your liking. To set a theme as the default theme, just go to the Branding tab, and tick the Make default box on the theme you wish to use as default. In addition to having one default theme, you can also create multiple branding themes, and choose which one to use for which individual asset. 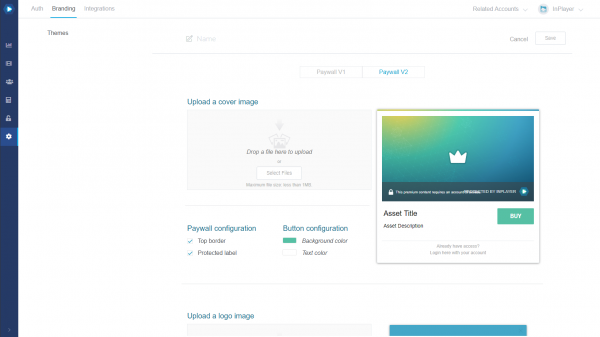 To do this, just select the branding theme you wish to use while you are getting the embed code for the asset. If you’ve decided to use the default theme, just select Select theme in the dropdown menu.